China-based Sigmaintell puts global demand for smartphone panels at 410 million units in the second quarter of 2018, up 12.4% from the previous quarter, which calculates to 364.8m in Q118. Sigmaintell agrees with Gartner that demand for smartphone panels was down in the first quarter of 2018 due to high inventory levels of smartphones at smartphone vendors and channels amid a traditional slower season for the industry. A clear-out of old models and plans to release new models in the second quarter will push most smartphone vendors to step up their purchases of panels, said Sigmaintell. China’s tier 1 vendors including Huawei, Oppo, Vivo and Xiaomi Technology are likely to purchase over 130 million smartphone panels in the second quarter, accounting for 31.7% of the global demand, Sigmaintell estimated. Apple's plans to launch three new iPhone devices, including two OLED-based models and one LTPS-based model, in the third quarter of 2018, which should drive up panel demand starting in the second quarter, according to industry sources. While Samsung Display remains the primary supplier of rigid OLED panels in the second quarter, there is no risk of oversupply of rigid OLED panels in the sector as Huawei, Oppo, Vivio and Xiaomi will consume the bulk of increased output of OLED panels rolled out by BOE Technology, Tianma Micro-electronics, Everdisplay Optronics and Visionox, said the sources. Demand for flexible OLED smartphone panels will be lower than expected, totaling less than 20 million units in the second quarter - a time in which BOE and LG Display will also begin to roll out flexible OLED panels, Sigmaintell said. Looking back at Q417, we highlighted the report by Gartner that for the 1st time Y/Y shipments fell. IDC released their version of Q417 shipments and reported that shipments fell by 6.9%. 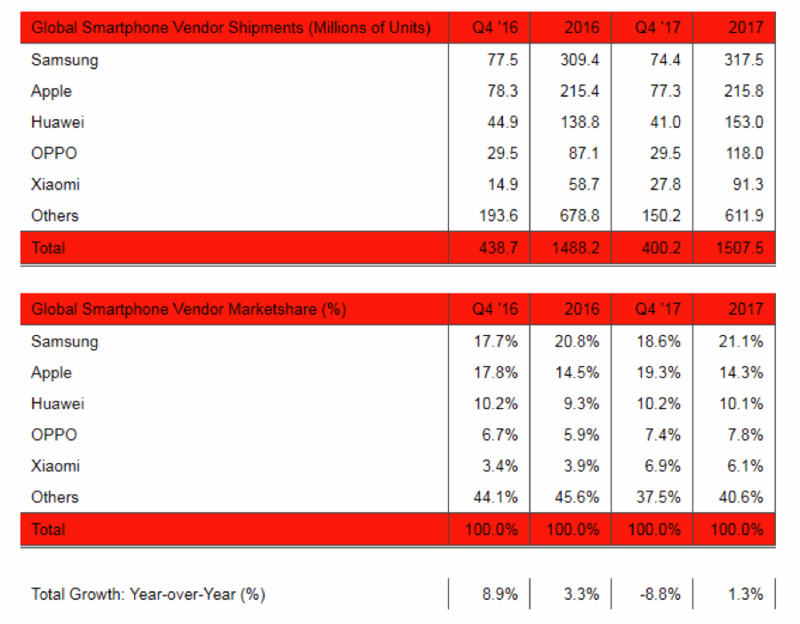 IDC counted 399.2m in Q117 and 439.1m in Q416, while Gartner had corresponding shipments of 407.9m and 432.1m. Canalys had Q417 and Q416 shipments at 400.2m and 436.7m. There was general consensus regarding Q417 vs. Q416.